I thought I would take some time to talk about how we’ve been handling the move with our turkeys kids. Mason and Cooper have been “in the know” since Jeremy’s interview back in April. We introduced the idea to them that there was a possibility of moving to another state. There was some push back at that point – sadness about leaving friends and family and questions about what life would be like in a new house. We made sure to listen to their questions and concerns so that they felt a part of the process. The last thing we wanted was for Mason and Cooper to just be told one day that we were moving without any warning at all. Jeremy and I never really talked about how we would handle it. We just did what came naturally for us. We’re an open family and don’t like to keep things from each other, so it was natural for us to talk about it. When we hadn’t heard from the firm in Providence for a while, talk about the move was put on the back burner. Jeremy and I were certainly anxious about it all and didn’t want to pass that anxiety onto the kids. Life went on, and we tried not to think about it. But when the call finally came, it was a joyous day! We included the kids in the celebration. Jeremy and I wanted them to understand how exciting this was – not only for Daddy, but for all of us. We included them in the house hunt and have asked for their help with packing as well. The entire time we have branded it as an adventure, and that mode of thinking has really helped get them excited about it. The key I have found is to let Mason and Cooper know it is ok to be upset, and it is ok to be excited even if it means leaving our loved ones behind. And as adults, we are going through many of the same emotions – excitement, nervousness, uncertainty, joy, sadness, even fear. We’re all in this together, though, and I have faith we will grow closer through this journey. If we continue to be open about it and talk to each other, we’ll get through the tough moments and come out stronger on the other end. No matter how you slice it, though, I think 300 blog posts is a great accomplishment. Sure, many of the bloggers I read can write 300 posts in less than a year, but I’m not a professional blogger or anywhere near as well known as them. And that’s how I like it. For those of you who have followed me from the beginning, thank you. For those that are new to following me, welcome. I look forward the next 300 posts and sharing the good I find in every day. Getting a home on the market to sell is tough. Doing it in a week is even tougher. 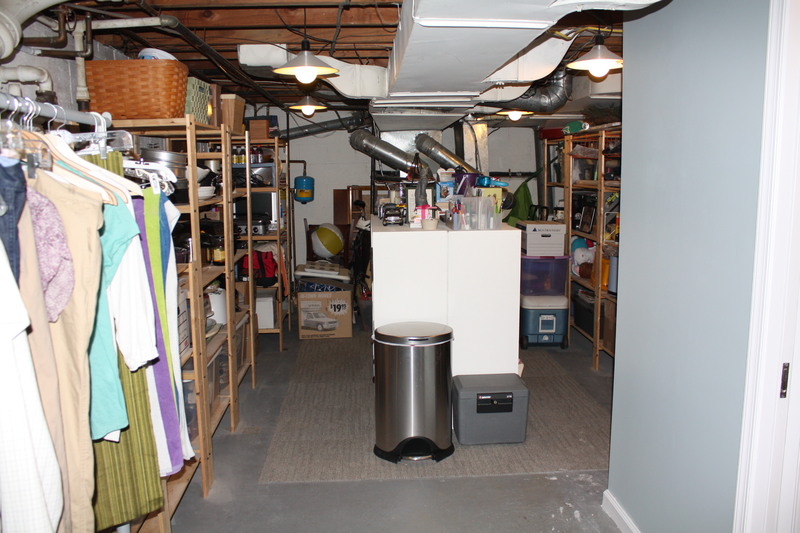 Doing it in a week while in the midst of a basement renovation… Well, it got done, so it is not impossible but it certainly felt that way for a bit! As I mentioned in my last post, we already had a realtor picked out. We chose a well-known realtor in the area, and we had actually worked with her before when we considered selling our home a few years ago. She is a no-nonsense woman, and that is what we wanted. We knew her results, trusted her guidance, and felt confident that she would be the one to help us sell our home quickly. She didn’t let us down. Thankfully, we are pretty organized people. And we also have good (neutral) taste when it comes to decorating, so our realtor told us we didn’t have to do much at all to get the house ready. We took a few knick knacks and pictures down. We cleared the tops of dressers and bookcases to look more streamlined. And we cleaned the house from top to bottom (including hiring window washers and carpet cleaners.) 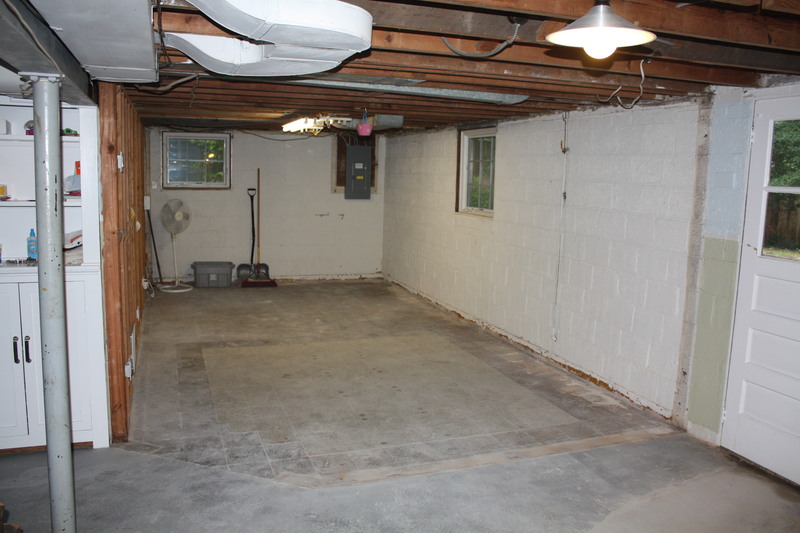 After all that, the basement was the only big thing left to do. We stayed up until midnight almost every night the week before the house went on the market. It was a tiring week. Our bodies ached, our stress levels were high, and we were eager to see the light at the end of the tunnel. By Friday afternoon, we were on our way up to Providence to look for a rental when we got the notice that the listing was up. Our house was officially on the market. 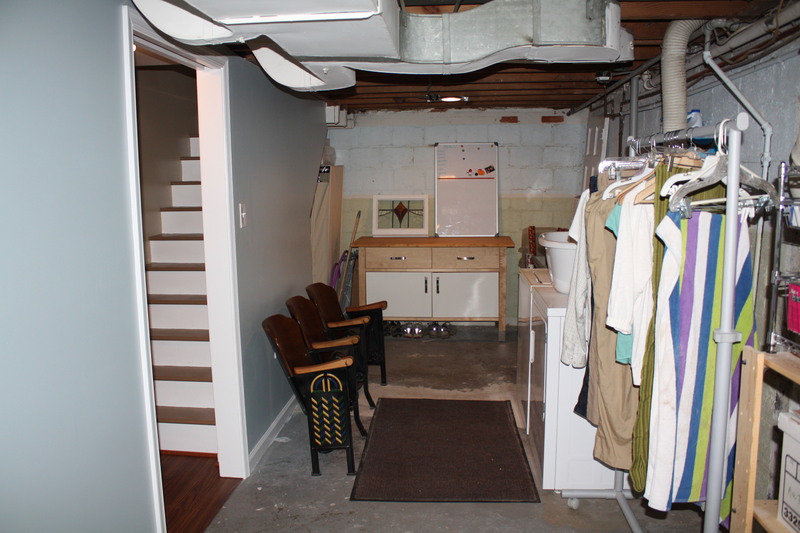 2 hours later, our realtor called to tell us that the major storms we were having caused water to come into our basement. We are so grateful she went to check on it. While we had disclosed the water issue (in the unfinished part), it was still stressful thinking that a buyer could have seen that. Our realtor assured us, though, that it was a blessing. She took pictures of the water so that if anyone asked, she could show that it wasn’t a big deal at all and could speak to it with first-hand experience. We loved that spin on it. By Saturday we had an offer. It was a low-ball offer, though, and we were pretty upset about it. Seriously, why would someone low-ball with an offer on the first full day it’s on the market? Crazy! We stressed all weekend about whether we were going to have to bring money to the table at the end. Our listing price was exactly what we needed to break even. If we got below that, we would owe money in order to pay for the realtor’s fees. It was putting a damper on the entire move experience, and we were seriously worried. But deep down, we had to keep reminding ourselves that a big impetus for the move was to get out from being house poor and start fresh financially. Bringing money to the table just might have to be our reality to break free. By Sunday we had three offers. Joy! We were ecstatic to hear that we were getting the desired results. We knew that if enough of the right buyers were out on the same weekend and looking at the other houses in the area in our price-range, most would see that even though our stats were low with the one bathroom, our house was a gem. We had hoped and prayed that a multiple offers would come in so that we could feel better picking one rather than having to settle. We were being rewarded for our hard work, and it felt great. By Monday night we had six offers. Yes, six! Because we were out of town all weekend, our realtor had told buyers agents that she would not be presenting offers until Monday night. It gave more buyers time to write up contracts. (And yes, the first people to put in a contract on Saturday came back with a better number.) Our realtor presented all the offers to us, and we dutifully went through the details of each, finally deciding on the best one. Quite a few signatures and initials later, we were officially under contract. 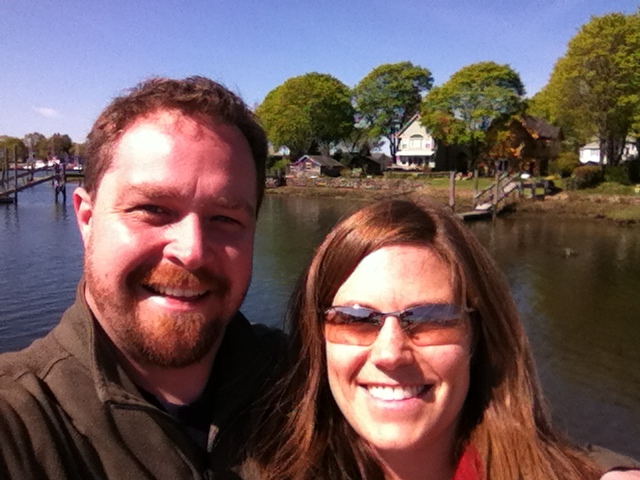 As soon as Jeremy got the offer from the firm in Providence, I emailed the realtor we knew we would use. We scheduled a meeting within 2 days, and our house was on the market by the next Friday. Needless to say, we worked our butts off to get everything ready in time. 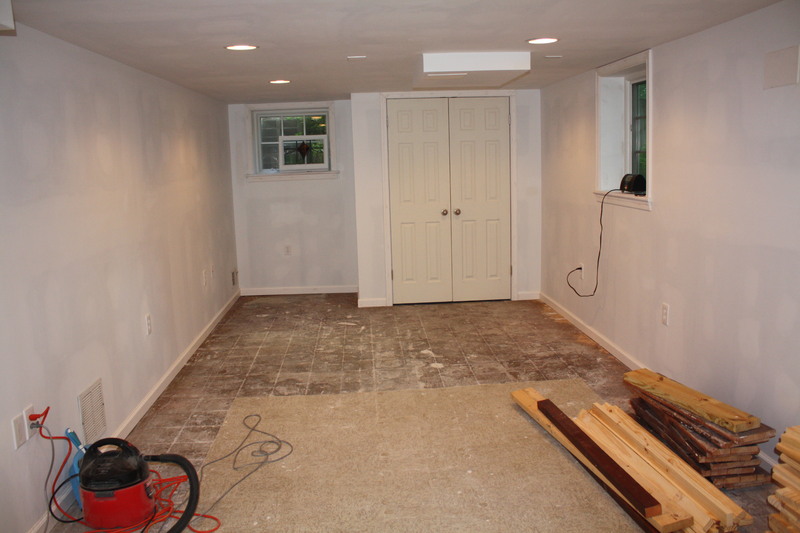 The key to the whole thing, though, was to finish the basement. 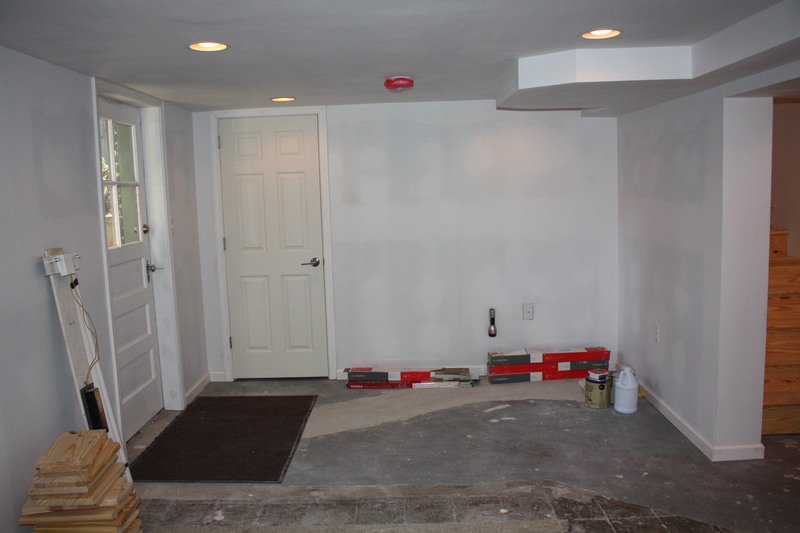 Fortunately we had been confident enough with my new job to start the basement back up a few weeks earlier. The contractors had finished all the electrical, drywall, and trim work, so all we had to do was paint and install the floors. Seems simple, right? Well, try to squeeze that all into one weekend while also trying to have a yard sale, get the house de-cluttered and clean. Not going to happen. Something had to give. And since our contractor had been working a lot with our realtor, we had a little extra weight to get them back in quickly in between other jobs. If we could finish the painting over the weekend, they could do the floors in a day. That would allow our realtor to get the pictures taken hours before she officially put it on the market. With all that in place, it was time to get crackin’! With the help of family (again), we managed to get the stairs rebuilt and painted, the doors and trim all painted white, and the walls painted a warm green. We decided to use leftover cans of paint we had in the basement. They were unopened cans from other rooms in the house, so we knew it would help tie it all together. But by the end, we were literally scraping paint out of the bottom of the can to finish second coats. (And don’t even bother looking at the ceiling. Not our best work.) But it got done in time for the contractors to come in and lay the floors. With everything complete, we “moved in” to the basement albeit with some staged furniture from our realtor (couch, chair and rugs). Despite it not all being ours, it completely works, and the room is gorgeous! Every day that I go down there now, I have a tinge of sadness for not getting to enjoy it more… wondering why we didn’t do the renovation sooner. It’s an amazing space, and I know the next owner will get to enjoy it in all its glory. So without further ado, I give you the finished product. The other end of the den showing the door to the backyard on the left, and the door to the work room at the far end. 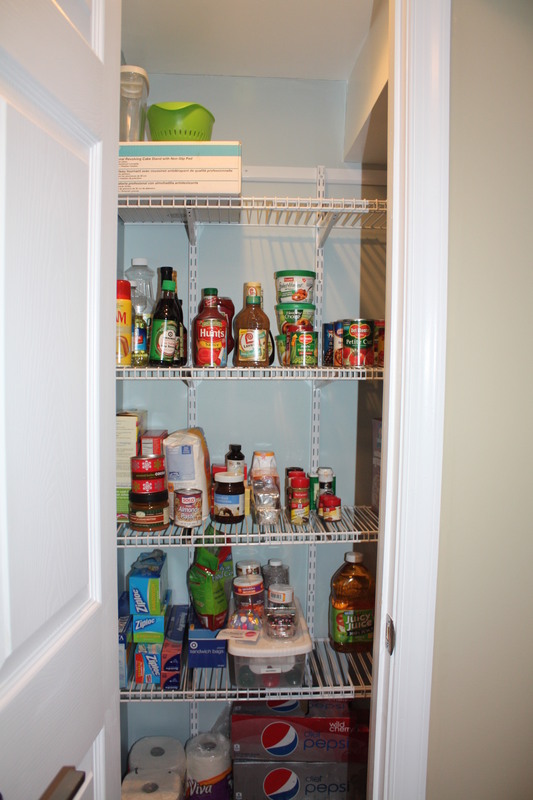 Oh pantry, my pantry. I am most sad to leave this since it took me 8 years to get it! The laundry area. You can see the new stairs to the left. The finished wall with the blue paint makes it a really decent space even without new floors and finished walls around the rest of the room. The storage area. We put some FLOR carpet tiles down in the storage area, and it really helps to make the space feel clean rather than dingy. 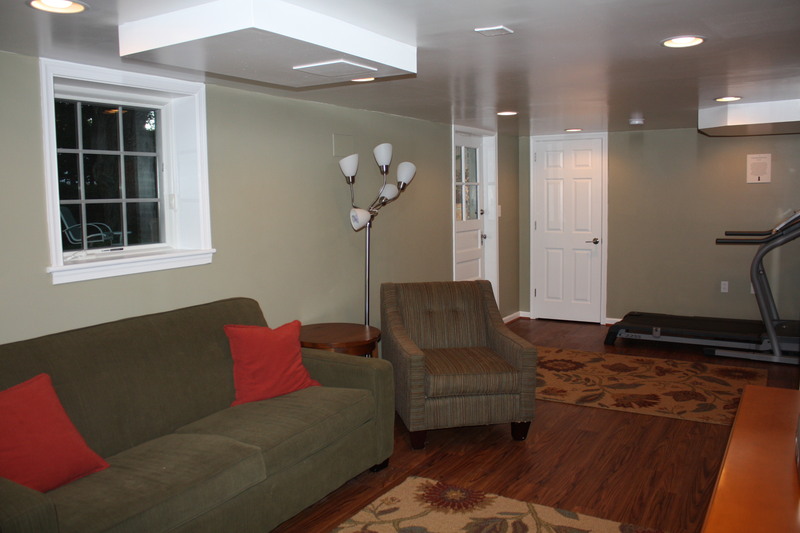 I love our new basement! We’ve enjoyed playing a few games down there (it’s a great space for the kids), and we’ve watched some So You Think You Can Dance (while the kids do their own dance moves). 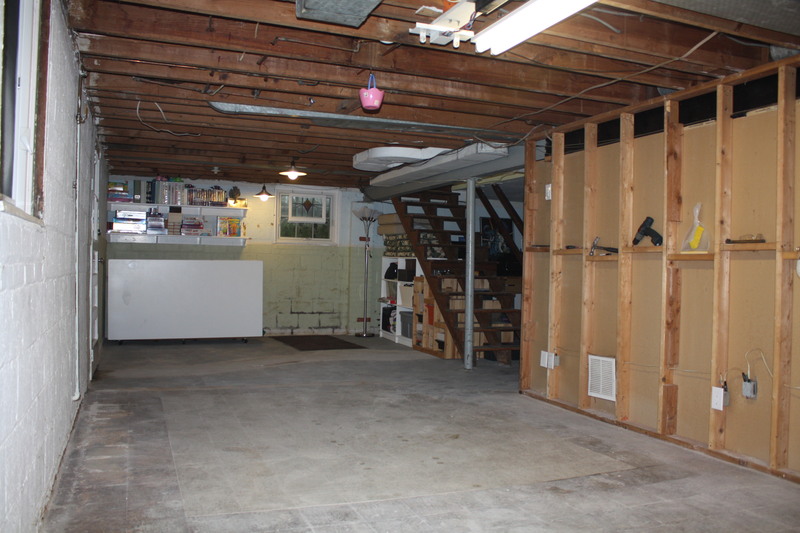 Even though we’ve barely gotten to use it, I will truly miss our basement. If only we had time for one last blow-out party! Leaving our current home is going to be hard. (That’s another post for another time, though.) 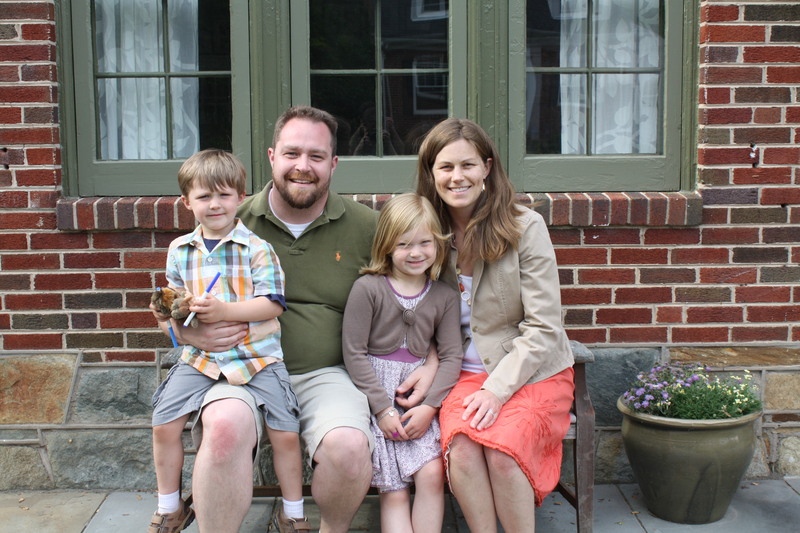 Jeremy and I knew that if we could find a new home in Providence that we loved and were excited about, it would make leaving our beloved home that much easier. Of course, that meant we had to find the house that was going to excite us. Who knew that would be such a challenge. 1. It eases the logistics of buying and selling. 2. It gives us time to save for another down payment since we’re not making much money on the sale of our current home. 3. It allows us to explore the area more and zone in on the neighborhood in which we would want to settle more long-term. 4. It gives us a financial break for a little bit, especially not knowing when I will find a job. House #1 – Small single-family home in Bristol with tiny rooms, a wet basement, an almost non-existent kitchen and beautiful landscaped yard. Decision: Not for us. While we LOVE Bristol (even more after finding the perfect bagel shop! ), it is a long commute to the city, and the house didn’t make up for that kind of sacrifice. House #2 – One-floor flat in East Side near Brown University with lots of “college-type” trash and “squatters” sleeping on air mattresses. I was closed to this place the minute we drove up, so I didn’t pay much attention to any positives inside. Decision: Despite being a fun area with urban amenities, it’s an H-E-double-hockey-sticks NO! House #3 – Adorable single-family home in Pawtuxet Village. It had an updated kitchen, 2 baths (Hallelujah! 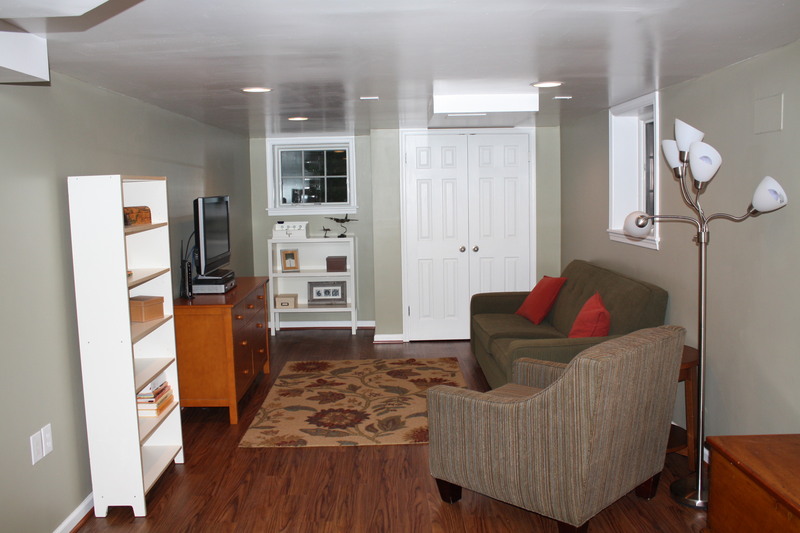 ), a big basement for storage, and was in a family friendly neighborhood near the water. Decision – LOVED this house! The style fit us very well, and the area was where we were hoping to be. It has a relationship to the water yet is still close to the city. House #4 – Two-story flat just outside of Pawtuxet Village. It was on a busier street, but within walking distance to many amenities. This place had so much space, which was awesome. But the kitchen left a lot to be desired, and we were unsure how the kids would do without any sort of green space nearby. Decision: While we loved the space (and 2 baths), it didn’t quite seem to fit us. Unfortunately the family living there was just starting to clean and pack up so that didn’t help matters. And I’m still scared of the dark laundry room! House #5 – Large single-family home north of the city in Oak Hill/Pawtucket. The house was on a busy road, and we were very unfamiliar with the area and not getting good vies. Inside the place was disgusting! I think even the Realtor was trying to talk us out of it. House #6 – Single-family home in west Cranston. The Realtor did not want to waste our time (or hers) with a viewing because we have 2 cars. The house has a one-car garage with a tiny driveway and no overnight parking on the street. We still drove by and thought it looked nice from the outside with a cute enclosed backyard. We even stopped at a lemonade stand a few blocks away and felt good with the neighborhood. Decision: We later talked to the Realtor and decided it might be possible to fit 2 cars if you leave the garage door open and pull the cars all the way in. Not ideal, especially since we still haven’t even seen inside, but might be worth keeping as an option. So there you have it. Our 6 options. Any guesses for which one we picked? If you guessed #3, you were right! After several stressful days of waiting after we turned in our application, the owner let us know that we had the house. We are so excited! The house is adorable and really fits the way we live. Now that we have a place to live up there, and our house is under contract in Maryland (more on that in the next post), it’s time to start packing and preparing for the big move. Please send me strength to get through it all. It’s Monday, and Mondays are hard. It’s hard to get up out of bed in time to get to work. It’s hard to get the kids out of bed in time to get them to school. It’s hard to think about the 5 days ahead of you before the next weekend. So we all need a little motivation. My motivation to get up this morning stemmed from the fact that I only have two more days of work before I’m off for the summer. I haven’t had a summer off in years! Only teachers know the real joy of summers off as an adult. I have always been jealous of teachers for that one simple fact. 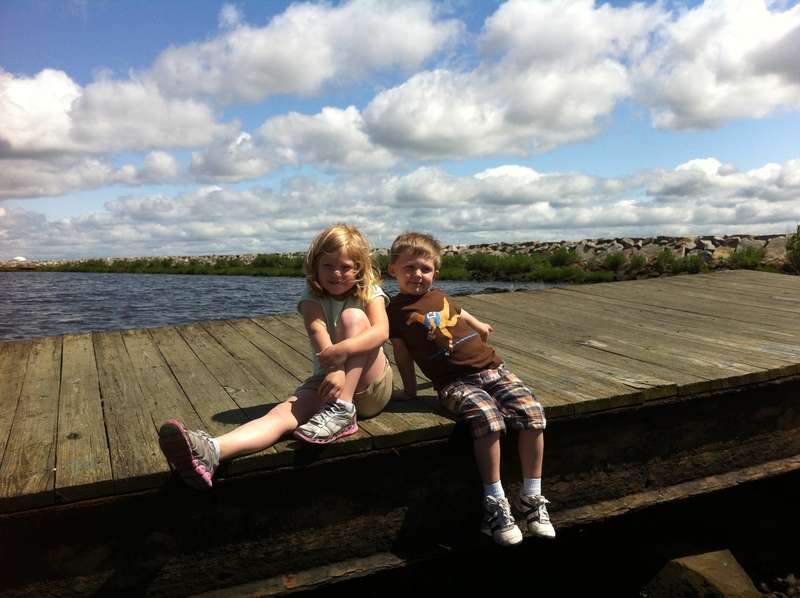 While having the summer off means I am unemployed again, we’re saving money by not having to send the kids to camp or daycare. And I’ll now be home to prepare for the move and take the kids on daily DC adventures with friends and family before we depart at the end of the month. I started my job just three short weeks ago. (Oddly enough, it feels like a lifetime ago!) A week and a half into my new job, Jeremy got the job offer. We immediately started thinking about how we were going to handle everything. The first thing that came to my mind is that I should quit my job so we don’t have to force the kids to adjust to the new school and camp they were set to start on June 18th. Since I wasn’t enamored with my job in the slightest, this was a really easy decision. I was set to be done this Friday, but they already found my replacement and want to get her started quickly. Fine by me! I’m linking up with Nain at View From Down Here for her Motivation Monday. Our life has been in flux for over a month. This is part of the reason I have not blogged much. I was unsure what to say when I had no idea what was going to happen in our lives. We were living in this in-between world of being unsure yet still cautiously optimistic. But now we can officially let the cat out of the bag. We’re moving! Are you ready for the real kicker? Remember this picture? It was from our trip to Providence for the interview. I was being sneaky. 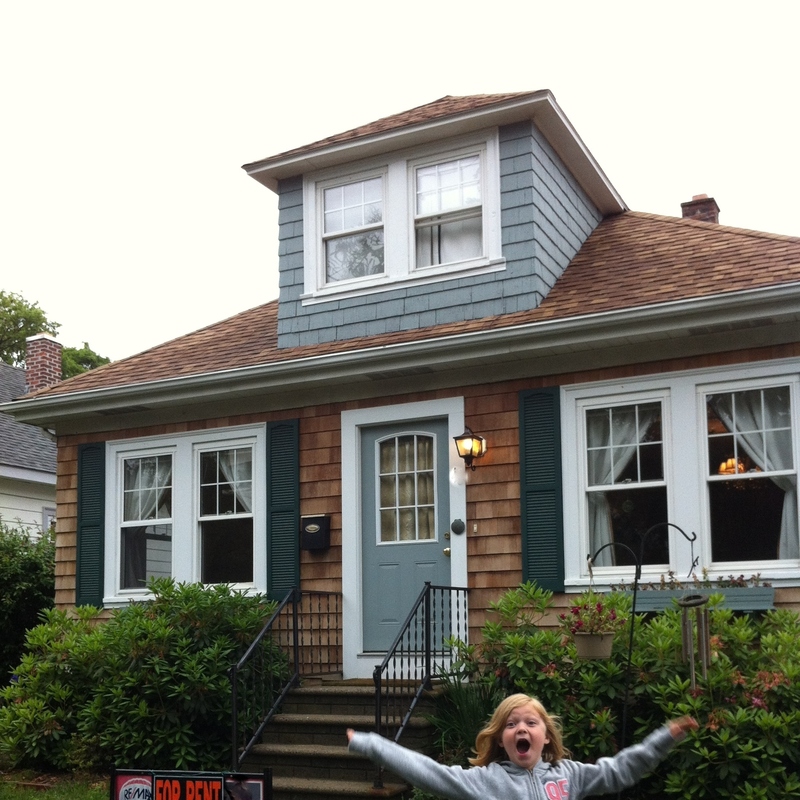 We’re moving to Providence, Rhode Island! Jeremy has been offered an amazing job in Providence, and we are ecstatic about the opportunity he is being given. We’re excited to finally realize our dream of living in New England, yet we’re very sad to be moving away from our tight-knit family and friends. It was a difficult decision that we didn’t take lightly. This is a big deal. But when it came down to it, we felt that the time was right to take this chance. Who knows what will happen, but we won’t find out until we try. Like one of my favorite quotes, “You can’t cross the ocean until you have the courage to lose sight of the shore.” We’re mustering up all the courage we have to make this move and see where our journey will take us. Now that I have been able to get this news out there, I hope to blog about the moving process, how we’re preparing the kids, our house search, selling our current house, and all the in between. It’s already been a crazy week since we made this decision, and the next month will be even crazier, but we’re doing the best we can to keep our excitement up amidst all the stress that comes with this sort of change. Wish us luck!